The Menchú family, who were Quiché Indians, lived in the beautiful northern highlands of Guatemala. Their peace was shattered when the military government and plantation owners started taking the land by force, land that had belonged to the indigenous people for generations. The Menchús fought for the rights of their people—at a huge price. Rigoberta Menchú’s brother was kidnapped in 1979, tortured, and burned alive while his family stood by helplessly watching. The following year her activist father and nearly forty others died in a fire at the Spanish embassy while protesting violations of human rights by the military government against the indigenous people. The horrors did not stop there. Within months of her father’s death, her mother, also an activist and a traditional healer in their community, was kidnapped, raped, tortured, and eventually killed. Nearly 200,000 Indians have been killed in the thirty-year-long battle. Menchú fled the country and lived to write the story of the horrific social injustices. The book brought international attention to the plight of her people. 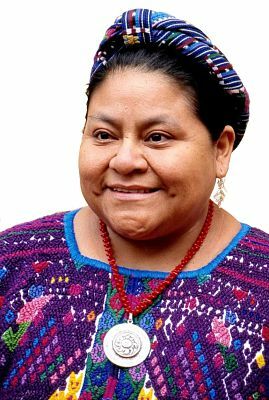 In 1992, at the age of twenty-three, Menchú won the Nobel Peace Prize for her book I, Rigoberta Menchú. She was the youngest person to ever win the prize. Awarded under much controversy—many thought the rebel movement conflicted with Nobel ethics of commitment to nonviolence—she maintained that she always worked for peace, even amidst the violence wrought upon her people. She dedicated the award to her father and used the $1 million cash prize to set up the Rigoberta Menchú Foundation to aid indigenous people. The United Nations declared 1993 the International Year for Indigenous Populations. Menchú became the spokesperson for the United Nations International Decade of Indigenous People (1994–2003). Their story had to be told. The Quiché Indians were poor and though many owned tiny plots of land, they could not produce enough crops to feed their families. They worked up to fifteen hours a day, eight months a year on coffee or cotton plantations on the coast to supplement their in-come, often in deplorable conditions. They lived in crowded sheds with no clean water. Menchú, like many other children, started working at age eight—otherwise she would not eat. Two of her brothers died while working on the plantations, one from malnutrition and the other from pesticide poisoning. When their land was taken, it was the last blow. Since indigenous people had no rights, Menchú’s father became an activist on their behalf, and the family followed suit. They formed the United Peasant Committee. As a leader in the 1970s movement, he was arrested and imprisoned many times for organizing petitions and protests against the military regime. When her family was killed one by one, Menchú learned Spanish and continued her father’s work, including staging a strike with 80,000 supporters who protested for fifteen days. Menchú became a marked woman. She fled to Mexico in 1982 and wrote I Rigoberta Menchú with the help of Venezuelan anthropologist Elizabeth Burg. The book was translated into several languages and became required reading in many universities. Menchú travels the world over to share her story. She continues her search for resolution and peace, and urges women and indigenous people to vote so that they can preserve the rights of all Guatemalan people.